A tattoo resembling a real tattoo and is a non-permanent image on the skin is called temporary body art. It can be drawn, painted, or airbrushed, but mostly these temporary tattoos are transferred to the skin. Usage of computer technology, modern ink and paper along with traditional four color offset printing comes into play to design these temporary tattoos that resembles the permanent one. These creations are totally harmless, fun and easy alternative for a permanent one. The main applications of temporary tattoos are self-expression and identification. Do you remember buying bubble gums for the sake of tattoos? Those temporary tattoos were made up of poor quality ink that often ended in blurry designs and could easily be washed or rubbed off. It would not be wrong if I say these tattoos were made popular by bubble gum companies. The modern temporary transfer tattoos are made of advanced ink and glue, and last much longer compared to older tattoos. Five main elements that a temporary tattoos has: the front of the sheet of paper, the back of the sheet of paper, ink, glue and a protective plastic sheet. A special coating covers the front of the tattoo. On this coating the tattoo image is printed with special inks. Then on top of the image a thin layer of glue is applied. 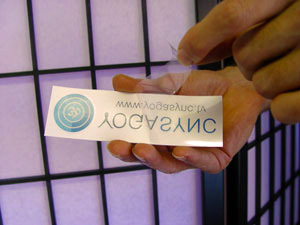 In order to protect the image and glue layer a thin, transparent plastic sheet is placed onto them. The back of the sheet has a list of ingredients and an instruction placed on it and is left untreated. Transfer temporary tattoos are usually applied by firstly removing the top plastic sheet, placing the image face down against the skin and moistening it thoroughly. The backing is then removed, leaving the image of tattoo in place.Several studies had concluded that technique used for creating these tattoos is safe and harmless. Inks, paper, plastic and adhesives used in printing of these tattoos are non-toxic. If you want to remove your tattoo is even simpler. One can use baby oil or nail-polish remover, however it will probably wear off as time passes, before you even want to remove it. Anyone can wear temporary body art.Social clubs, school groups, sports teams, friend groups, etc. uses temporary tattoos to endorse themselves. Earth First Printing © 2019 All Rights Reserved.